HOUSTON – (April 3, 2018) – Rice University students enrolled in the sociology course “Social Problems” will host “The Kaepernick Effect: A Discussion on Protest in Sport” April 11 at 7 p.m. in Keck Hall on the Rice campus. The event will explore the controversial form of protest first displayed by American football quarterback and current free agent Colin Kaepernick. He became a national figure and ignited controversy by refusing to stand while the United States national anthem was being played before the start of NFL games. His behavior was in protest of what he perceived as racial injustice in the U.S., and prompted both positive and negative responses. WHERE: Keck Hall on the Rice campus, 6100 Main St. The panel discussion will include Jerome Solomon, a Houston Chronicle sports columnist; Sean Jones, radio host for Houston’s SportTalk 790, former NFL player and Super Bowl champion; Nate Boyer, former NFL player and Green Beret; and Chief David Brown, former police chief of Dallas. Food will be served at the event, which is free and open to the public. 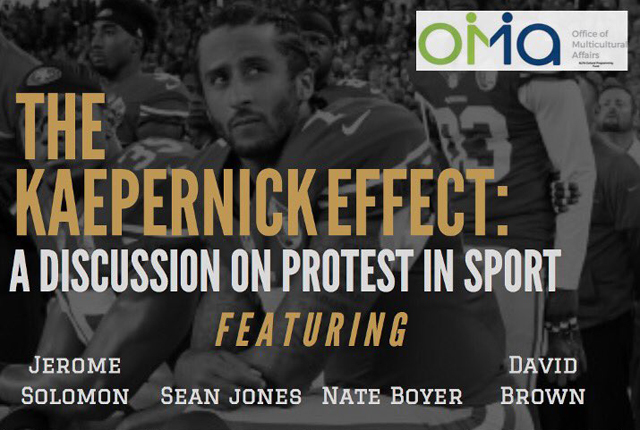 To reserve a seat, visit https://www.eventbrite.com/e/the-kaepernick-effect-a-discussion-on-protest-in-sport-tickets-44599581549. Media interested in attending the event or interviewing the panelists should contact Amy McCaig, senior media relations specialist at Rice, at 713-348-6777 or amym@rice.edu. Photo credit: Rice University Social Problems course.